At 9 ounces (250 grams) the MD6 is a compact, convenient pocket Doppler. The high quality audio signal uses Dynamic Noise Reduction (DNR®) and is easy to hear, even in a noisy room. The patented red and green LEDs on the end of the Doppler probe show you visually when you are on the artery at the best place for a signal (it flashes a bright green LED light which is brightest when you are on the “sweet spot”). Green means flow towards the probe or arterial blood. When the probe is over a vein the LED flashes red to indicate flow away from the probe. To get an audio stereo effect for distinguishing blood flow, purchasing optional stereo earphones allows you to hear flow towards the probe in the left ear and flow away from the probe in the right ear. The controls for Doppler on/off and chart recorder start/stop are on the probe. The Doppler uses rechargeable NiCad batteries and is charged separately from the chart recorder. 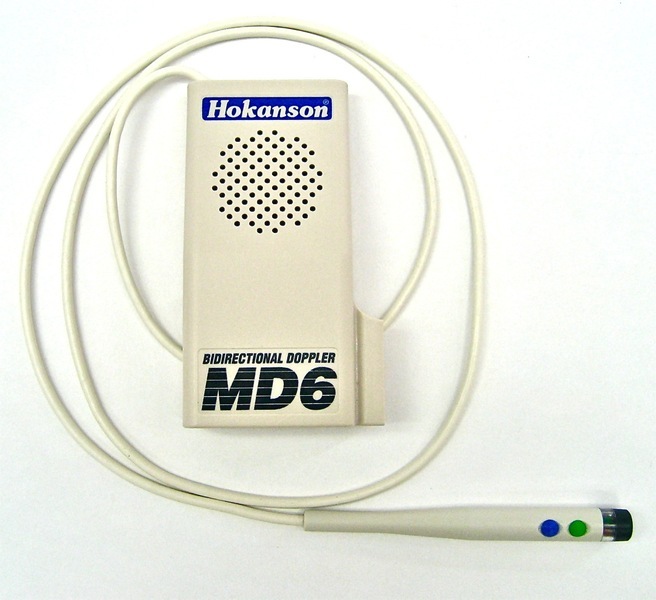 When inserted on the input jack of the MD6VR chart recorder, the waveforms from the Doppler can be recorded. Dynamic Noise Reduction (DNR) for high quality audio signal. Direction of flow indicator lights to assist in probe positioning. On/Off controls on the probe for easy access and control. On/Off controls for the chart recorder.